By popular demand, we now have an option for carrying your iPhone or iPod on your bicycle handlebars! We tracked down a model that sells for less than half of many other commonly-available models! The iPod / iPhone case by Ibera is $23.99, and it includes a handlebar clamp that fits most common bikes (22.2mm - 31.88mm diameter handlebars). The clamp also has a mounting bracket that lets you attach a spare water botle cage to your handlebar. The case easily attaches and detaches from the clamp with a quick release mechanism. 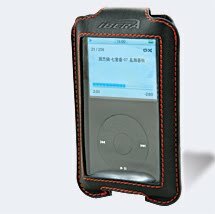 Best of all, the case's clear polyurethane cover allows you to operate your iPod / iPhone controls with the device inside the case. Now in stock in all three Century Cycles locations!